Our team of experienced leaders in sales, marketing, call center management, training and development will evaluate objectively each customer touch point in your process, defining each department's role in the overall service delivery process. 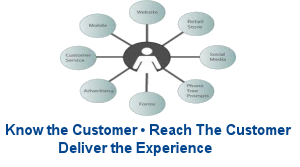 We believe contact centers that implement and focus on a customer centric approach to the overall service delivery work more effectively because the whole organization becomes involved and accountable for the customer experience. Customer Service 101 is a division of Evans Consulting Group focused specifically on customer service training and development. We offer customized customer service training programs to meet your organization's specific needs. Depending on your training requirements, we offer instructor-led workshops at your site or develop programs for your team to deliver. Sherry Redden Evans, managing director of training & development, is recognized in the customer service community as a leader and is an accomplished speaker in the dynamics of customer service delivery within organizations. Sherry and her team will be with you every step of the way from the needs analysis to post assessment follow-up to ensure the success of the program. It is a well-known fact that it costs much more to attract new customers than it does to keep existing customers. Each customer interaction that occurs over the lifecycle of the customer's business relationship with your organization defines how it is perceived and has a major impact on your bottom line. Have you had an outside audit to verify your customer experience processes by someone outside of your organization? If not, you should. viewed as part of a "whole" organization. Ask yourself this question - "who within my organization does NOT have an impact (directly or indirectly) on our bottom line?" 68% quit because of an attitude of indifference towards the customer by the staff. The objective of the Customer Touch-Point Analysis Program by Evans Consulting Group is to identify every touch point throughout the customer experience from “cradle to grave.” We will chart out each customer experience through our in-depth analysis and provide you with an extensive assessment of each process, identify roadblocks, and offer solutions from the technical infrastructure to the service / support representative. We Take a HOLISTIC Approach of the Whole Service Experience Within Your Organization. Cobb County Transit Coca Cola North America Collins & Aikman Floorcoverings DeKalb County Public Schools Equisys, Inc. Copyright ©2012 by Evans Consulting Group. Will Always Remember How You Made Them Feel"